To complement my home automation system I needed to add a multi-channel power measurement system to my DB board. I figured four channels is a good place to start: total incoming (or one day outgoing) power, house power, geyser (hot water heater) power and cottage power. I discovered this hybrid board at Banggood recently and it's great! 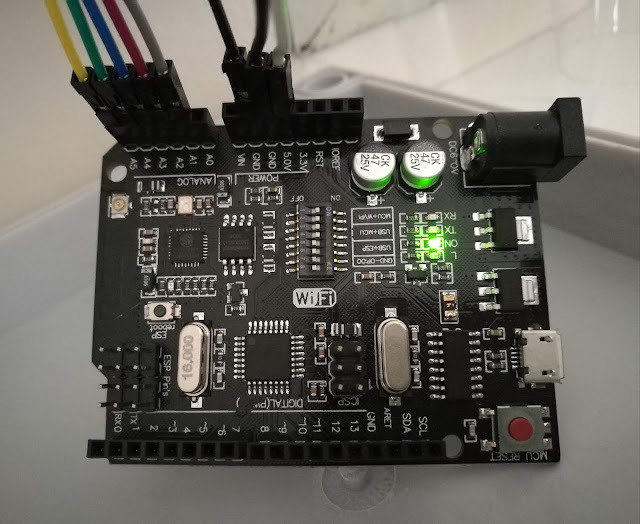 It has an Arduino Uno form factor with the usual Atmega328p microcontroller which is good for stability and robustness. It then couples a ESP8266 via the serial ports and also breaks out the ESP GPIOs just in case. Perfect! I have so many plans for these boards :) I am concerned about the stability and robustness of ESP8266s for long-term installations such as home automation systems and so I think that devices using this are the way forward given that the Atmega328 is well proven. I used clip-on current transformers (30 A ones for the various circuits and a 100 A one for the incomer) and a normal linear transformer for the voltage measurement. Much to my surprise, the mains voltage at my house fluctuates between around 208 V and 230 V! It's important to measure this as this is a very large error on the "ideal" 220 V.
I built four of the standard Arduino Emonlib (Open Energy Monitor) circuits for each of the channels as well as a voltage channel. My 50% DC bias voltage was common - no need to build four of these too! Unfortunalty, I don't have a circuit diagram of the final design. I used 1% resistors everywhere and I also used 3.3 V zeners for spike protection as used in the standard designs. A photo of the (almost) final product is below. I simply soldered all the bits to the plugs and wired the plugs to arduino pins. The wiring isn't neat yet but it's a work in progress! I found that while it is indeed possible to power the board from the 6 V 500 mA linear transformer that is used for voltage measurement, the start up time is very slow and the power on reset didn't always trigger. Instead, I wired up a 5 V switch mode power supply. The code for the Atmega is below (it's a bit rushed...). ct1.current(2, I_CALIBRATION, I_OFFSET);      // Current: input pin, calibration. ct3.voltage(1, V_CALIBRATION, 0.79);           // a resistive load such as a hot water geyser. After setting up my Armbian based Mosquitto gateway and having it run for a few months I wasn't happy with the stability. The Orange Pi Zero with read-only OverlayFS, etc. just didn't seem to work 100% and sometimes on reboot mosquitto didn't come up, etc. I tried DietPI, which is really great, but it doesn't support a read-only mode out of the box. The solution (I hope) is OpenWRT! 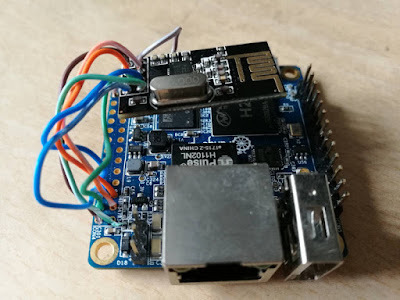 I couldn't find a version for my OrangePI Zero, although I suspect that any AllWinner H3 based version would work. I did have a Cubieboard2 with a nice 3D printed enclosure lying around though. I also have a laptop drive addition to the enclosure which I can use for CCTV and storage intensive tasks. The benefit of OpenWRT (or LEDE) is that it's designed to be read only and super robust. It's no good for a router to crash after sudden power outages... I downloaded the squashfs version (I don't have time to waste on ext4 stability). 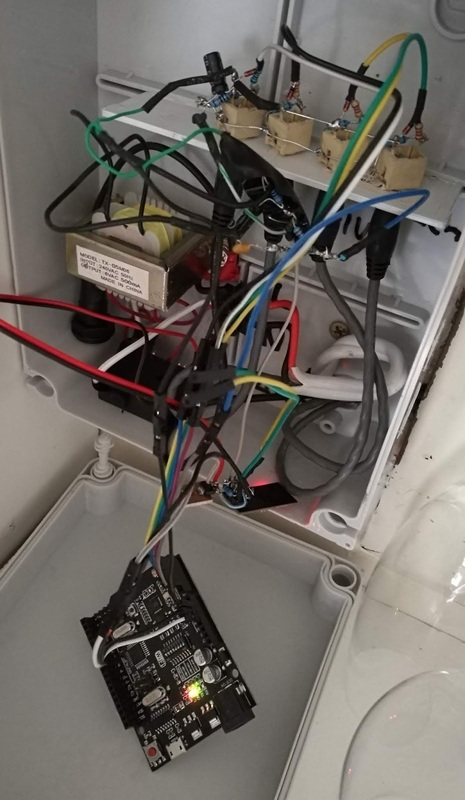 This post lists the details to get it installed and running. I opted to use the latest stable version, 17.0.1.4, for the sunxi target: https://downloads.lede-project.org/releases download the squashfs version: direct link. I suggest using the latest stable version that's available when you read this. 1. Connect the board to a computer directly. Set the computer static IP to 192.168.1.2. Login and make the board some other static IP or use DHCP. 2. Use a 3.3V serial to USB and edit the network config at /etc/config/network and set a proper IP then reboot. 3. Mount the SD card and edit the file with your computer (do this just after dd'ing the card). You have to run the update command after a reboot as the files seem to get cleared to save flash space (clever). In addition, I plan to use the board to save files from my CCTV cameras. Samba is pretty heavy weight and FTP is lightweight. Performance is no issue on the Cubieboard and the camera's support both so I'm installing both. I'll use samba to access the files from Windoze, etc. and FTP to write from the cameras. It seems that samba comes with a nice web config with luci! Sweet! FTP needs a little bit of manual config though... I'll be using the SATA port for the hard drive but you can use USB too. See the official guide for USB. Before continuing, first reboot the system to ensure everything is saved and working. Check this tutorial for sharing via samba and this for FTP. I set up guest access to my CCTV share which is a directory on the shared drive. I made this directory readable and writable by anyone suing chmod 777 ./cctv otherwise I would have to set up users. 1. Enable a heartbeat "flashing" LED so that you know at a glance that the system is up and running. 2. Set up a fsck on the mounts just to keep the clean (in the mount points settings). Lets hope the mosquitto gateway is rock solid now!